If I were a Harry Potter character, I’m fairly sure the Sorting Hat would not have placed me in Gryffindor, simply because I’m not really a brave person. Yes, at times in my life, I’ve been able to stand up in front of the crowd, singing or acting, and I was, for a long time, very good at making new friends. Not so much any more. The last few years of my life have left me a very different person, and so many things scare me these days. It’s difficult to be in crowds, and the idea of having to talk to too many people I don’t know is terrifying. I’ve had panic attacks in public places, including the local Fred Myer, where I wound up crying in the manager’s office. These events had been getting farther between, until recently, when certain things began making me very nervous. If you’ve been reading this for long, you know I share a home with my extended family: my parents, who are 78 and 83; my younger sister and her two children, who are 10 and 20; plus two cats and a dog. During the last year my father lost his job, and hasn’t been able to find another one; he has also begun showing signs of dementia, which is difficult for all of us. Mom hasn’t worked outside the home in years; they have some Social Security coming in, but no savings. My sister hasn’t had a steady job in over a year, just temp things, and my while my niece has a full-time job, she doesn’t help out much. Hence, the only real income in the household now are my SSI/SSD checks every month, and Mom & Dad’s Social Security. Not a lot for all these people to live on. Jolene & I both get food stamps, which helps, and for now, all of our medical expanses are taken care of. The big issue is the house payment; we cannot afford this house. When I moved back in here two years ago, my goal was to stay a few months and then get a place of my own. But things went downhill very fast; I sank into depression after the breakup and Michele’s death, and still haven’t fully recovered. It was easier to hide in this room than get on with my life. But now, I don’t have a choice, and this scares me. My parents are talking about selling the house, and this means we’ll all have to move. Sure, they’ve been talking about selling for years, but this time they’re actually doing things to put it in motion. Getting the basement presentable. Talking to realtors. Getting rid of things. And scaring the hell out of me. My tiny room is full of stuff, and I have dozens of boxes in the garage. Every few days I’m encouraged to begin sorting, getting rid of things, both so the place will look better for prospective buyers, and so it will be easier to move. Jolene has done a bit of this in, but I’ve yet to begin, even though I’ve nothing but time on my hands. At first I thought I was just procrastinating, as usual, being my normal lazy self. I’ve had several conversations about where I’d go when the house sold with different people. Jolene proposed we get an RV, put Max in online school, and tour the country. I’ve discussed getting an apartment with my ex-husband and friend, Charlie (we get along well, and he’s easy to live with), but it’s never gone farther than discussion. But recently I realized that I honestly have no idea what is going to happen to any of us, and this is nerve-wracking. Some part of me believes if I don’t do anything, the unknown will stay far, far in the future, and I won’t have to think about it. 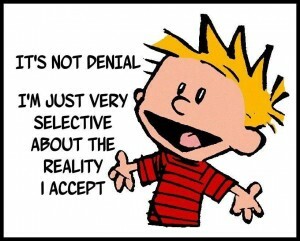 Denial is my favorite river, and I swim deep in it. I’m not sure what to say that could be helpful. I know that this blog stirred up all sorts of fear and dread in me, and you have my deep, deep sympathy for being in the situation you’re in. Please keep us updated on what you decide to do and where you decide to go. It might be helpful to take a picture of some memorabilia and store digital copies. There are cool programs that will allow you to create a virtual scrapbook that lives in the cloud. Having a photo may make letting go of things easier, and I do believe it’s freeing to lighten the baggage whenever we can. Thanks. I’m working on it!